Virat Kohli-led team India recently beat Sri Lanka by a whopping 304 runs in Sri Lanka, but it does seem to have sufficed Sourav Ganguly’s appetite. Former team India skipper Sourav Ganguly has gone on to say that ‘Virat Kohli has not been tested as yet’. That is a really big statement to make considering Virat Kohli has hardly put a foot wrong in Tests, ever since he took over the mantle from Mahendra Singh Dhoni. It was Dhoni’s big boots the Delhi-boy had to fill, and he has done it with perfection. That is exactly what the stats suggest. The Indian team is in Sri Lanka for a 3-Test match series, followed by a 5-match One Day International and then a one-off T20I to round it off. India won the first Test in under four days, which means they have got ample time just to ease off. 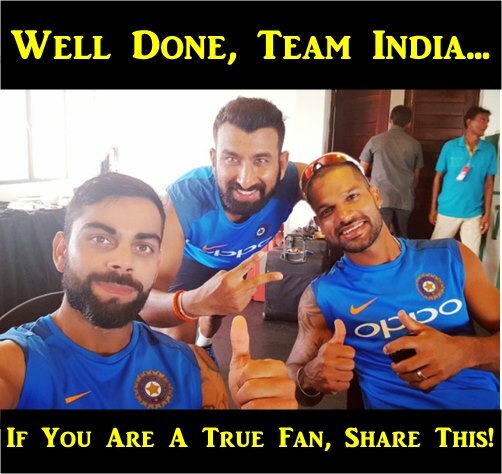 They were playing FIFA after they won the first Test. They are really making the most of their Lankan tour! “Virat hasn’t been tested yet. Sri Lanka is probably not the strongest Test side at the moment. For me, the fans as well as for Virat Kohli himself, the yardstick will be how well his side performs in South Africa, Australia and England,” he said speaking to India Today. Well, Virat Kohli has also got an unbeaten century in the second innings of the first Test between India and Sri Lanka at Galle. This happens to be Virat Kohli’s 17th Test century. Rohit Sharma and Shikhar Dhawan also took time out to go and check out restaurants in the Emerald nation. I his statement he also compared Hardik Pandya to Ben Stokes and said that the young all rounder can add value to the team in the future.